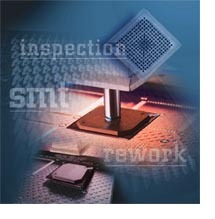 BGA rework is a specialized rework process in which BGA packages need to be removed and replaced using a controlled process in which the original manufacturing process needs to be duplicated while not damaging either the package or destroying the integrity of the connection of nearby components. There are numerous methods one can use to replace a BGA (original device or reballed device) for plastic packages. There are two basic materials you can use for the replacement of BGA packages—either “tacky flux” or solder paste. Tacky flux has the advantage of being easier to process for BGA rework.. The downside of this method is the first-pass yield of the process is lower than that of other methods as the process window is smaller as the it is not as forgiving when it comes to device or PWB warpage. The other material one can use for attachment is the same alloy solder paste as that used for original assembly. This BGA rework method has historically been more difficult and time consuming for BGA replacement while at the same time having a greater first pass yield. Whether you are using paste flux or solder paste StencilQuik™ greatly simplifies your BGA rework process while providing for a reliable connection This method features a unique stay-in-place feature which simplifies the placement while increasing the yield of reworked BGAs. These flexible solder paste stencils remain in place on the site location becoming an integral part of the PCB assembly. StencilQuik™ is manufactured from a polyimide film with a high temperature adhesive covered with a release liner. It is the same type of material you have been using with bar code labels and for protecting gold fingers during the wave soldering process. These stencils are laser cut from high quality, anti-static polyimide film with a residue-free high temperature adhesive backing. 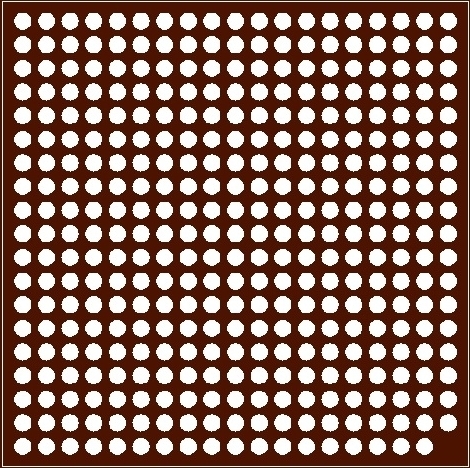 The StencilQuik™ apertures correspond to the land patterns on the PCB and define those portions of the PCB which are to have paste or paste flux applied during the BGA rework process. Contact BEST for an StencilQuik™ evaluation kit where you can see the process first hand.